Let’s look at the problem here? What are we trying to stop with captchas? You are more than likely not interested in accepting it. What do we not want to block? People submitting genuinely innocent input. If a person is prepared to fill out a form manually, even if it is spam, then a person can view the submission and very quickly delete the validated, filtered and possibly sanitised message. recaptcha uses this technique. See below for details. Uses images which users have to perform certain operations on, like dragging them to another image. 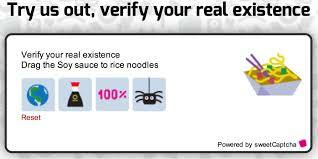 For example: “Please drag all cat images to the cat mat.”, or “Please select all images of things that dogs eat.” sweetcaptcha is an example of this type of captcha. This type completely rules out the visually impaired users. Pioneered by… you guessed it. Facebook. This type of captcha focusses on human hackers, the idea being that they will not know who your friends are. I disagree with that statement. A determined hacker will usually be able to find out who your friends are. There is another problem, do you know who all of your friends are? Every acquaintance? I am terrible with names and so are many people. This is supposed to be used to authenticate you. So you have to be able to answer the questions before you can log in. This is what textcaptcha uses. Simple logic questions designed for the intelligence of a seven year old child. These are more accessible than image and textual image recognition, but they can take longer than image recognition to answer, unless the user is visually impared. The questions are usually language specific also, usually targeting the English language. This is a little like image recognition. Users have to perform actions that virtual intelligence can not work out… yet. Like dragging a slider a certain number of notches. If an offering gets popular, creating some code to perform the action may not be that hard and would definitely be worth the effort for bot creators. This is obviously not going to work for the visually impaired or for people with handicapped motor skills. total-captcha. Depends on node-canvas. Have to install cairo first, but why? No explanation. Very little of anything here. Move on. How does this work? Do not know. What type is it? Presume text recognition. simple-captcha looks like another text recognition offering. I really do not want to be writing image files to my server. node-captcha Depends on canvas. By the look of the package this is another text recognition in a generated image. re-captcha was one of the first captcha offerings, created at the Carnegie Mellon University by Luis von Ahn, Ben Maurer, Colin McMillen, David Abraham and Manuel Blum who invented the term captcha. Google later acquired it in September 2009. recaptcha is a text recognition captcha that uses scanned text that optical character recognition (OCR) technology has failed to interpret, which has the added benefit of helping to digitise text for The New York Times and Google Books. sweetcaptcha uses the sweetcaptcha cloud service of which you must abide by their terms and conditions, requires another node package, and requires some integration work. sweetcaptcha is an image recognition type of captcha. textcaptcha is a logic question captcha relying on an external service for the questions and md5 hashes of the correct lower cased answers. This looks pretty simple to set up, but again expects your users to use their brain on things they should not have to. After some additional research I worked out why the above types and offerings didn’t feel like a good fit. It pretty much came down to user experience. Why should genuine users/customers of your web application be disadvantaged by having to jump through hoops because you have decided you want to stop bots spamming you? Would it not make more sense to make life harder for the bots rather than for your genuine users? Services like Disqus can be good for commenting. Obviously the comments are all stored somewhere in the cloud out of your control and this is an external dependency. For simple text input, this is probably not what you want. Similar services such as all the social media authentication services can take things a bit too far I think. They remove freedoms from your users. Why should your users be disadvantaged by leaving a comment or posting a message on your web application? Disqus tracks users activities from hosting website to website whether you have an account, are logged in or not. Any information they collect such as IP address, web browser details, installed add-ons, referring pages and exit links may be disclosed to any third party. When this data is aggregated it is useful for de-anonymising users. If users choose to block the Disqus script, the comments are not visible. Disqus has also published its registered users entire commenting histories, along with a list of connected blogs and services on publicly viewable user profile pages. Disqus also engage in add targeting and blackhat SEO techniques from the websites in which their script is installed. The above solutions are excellent targets for creating exploits that will have a large pay off due to the fact that so many websites are using them. There are exploits discovered for these services regularly. Recording how long it takes from fetch to submit. This is another technique, in which the time is measured from fetch to submit. For example if the time span is under five seconds it is more than likely a bot, so handle the message accordingly. Spamming bots operating on custom mechanisms will in most cases just try, then move on. If you decide to use one of the common offerings from above, exploits will be more common, depending on how wide spread the offering is. This is one of the cases where going custom is a better option. Worse case is you get some spam and you can modify your technique, but you get to keep things simple, tailored to your web application, your users needs, no external dependencies and no monthly fees. This is also the simplest technique and requires very little work to implement. Usually ignore CSS. For example, if you have some CSS that hides a form field and especially if the CSS is not inline on the same page, they will usually fail at realising that the field is not supposed to be visible. So what we do is create a field that is not visible to humans and is supposed to be kept empty. On the server once the form is submitted, we check that it is still empty. If it is not, then we assume a bot has been at it. This is so simple, does not get in the way of your users, yet very effective at filtering bot spam. // Bots love to populate everything. // We know the bot-pot is of zero length. So no bots. So as you can see, a very simple solution. You could even consider combining the above two techniques.